In fact, when Sam shot the video, he asked me if he should shoot it with the image or just with sound, as if reading my thoughts. But I told him he could go for it, even though I was aware I might never let it see the light of day. "I can't look in the mirror and say mean things to myself anymore, because my body has done great things. Very recently, I made an entire human being with this body, and then gave birth to him at home after a very long labor. I did that. With this body. This amazing, beautiful, capable body. 'Obese' or not, I'm worthy of love and respect. I'm beautiful inside and out. My body rocks." It’s incredibly hard to be the first, or in the first generations, when we have so little to guide us, so little to let us know 'yes, you can' and 'yes, this is "normal"', and 'no, you are not alone'. And it’s scary, and hard, and often risky. So I’m not going to shame anyone for not taking or sharing pictures of themselves. But I am going to say please. And you deserve to be seen. And you are not alone." So here, unabashedly, is my fat pregnant belly with a beautiful, strong baby heart beating underneath. The thing I want to shine through is my own joy at hearing that tiny heartbeat, no matter what I look like. And you can equally be amused by Mikko's reaction, which is distaste, every time. Even watching the video, he told me again, "I don't like that sound." The lovely song is "Sweet Sweet Baby," by Michelle Featherstone . I updated the captions, because I originally had them illegibly small, which messed up the audio a bit in places. Also, it's cutting off the sides of the captions, so maybe it's better to view it on the video page. Such is life. What I'll point out is that there's a shot at the beginning when the camera's on my stomach, and I edited it away almost immediately to be a shot of a better angle, even though the continuing audio is from the original shot. I didn't want anyone to look too hard at my belly — see? Anyone else want to answer the call and post a bare belly bump, no matter what it looks like? You look beautiful! I love seeing pregnant women. It is amazing. You know yourself better than I would, but I think you're being too hard on yourself. Your posts are really insightful, though, because no one should compare her body to anyone's else. It seems your advice, and others' too, is: Your body knows what to do, just follow your instincts. You look like a healthy, beautiful pregnant woman in these pictures and videos! You do look a little pissed off in the photo. But you mostly look beautiful and I love your pregnancy fashion. Wow, Lauren, thank you for writing this and sharing those videos. This brought tears to my eyes, and I'm also glad that my post spoke to you. You are so brave and beautiful! Wow. I don't think you look fat at all in that photo! You just look like a healthy pregnant woman! I love this online trend of "real" pregnant women! It makes me wish I had been braver when I was pregnant. I did not embrass my fat and pregnant self. And girl, you don't even know stretch marks! I look like my stomach was attacked by a bear. I'm almost cool with my fat and beautiful status, but I'll never be cool with those stretch marks! I did a while ago, it was taken on my due date. I didn't get many stretch marks with no. 1 and was rather proud of them this time around, because they tell the history of two babies. I even edited the photo to emphasise the stretch marks! And see that loving kiss from my first born? She adored my belly! Awesome post! And yes, you look great. :-) And it's SO FUNNY how opposed Mikko is. Aw. I was an older sib, so I get it. I hope I'm still considered a "real" pregnant woman even though I'm not obese. Your post did inspire a quick post (with photos) from me, too. I hope you see the support in it. I don't see you as fat at all, whether you are or not. Thank you for this. I've been brewing a post about my weight issues for awhile, and this post was what I needed to actually post it. You are beautiful. Has anyone told you that you look a bit like a brunette Meryl Streep? Thank you for being brave enough to put yourself out there for the rest of us. It matters. Thank you for this Lauren! I think you look fantastic, and are an inspiration at any size. I, too, have had this topic on the brain lately (I guess many of us women think about it often), and I may have to do some sharing of my own soon. Oh, Lauren, you look so gorgeous! Your posts always lift my spirits. Thank you for sharing your beautiful words and self. Love this post. My belly is a nice enough shape, and looks good under shirts, but with nothing on it you can see all the stretch marks and um... hair. Hairiness is in my genes and for some reason getting pregnant made my belly grow a little extra hair. Not a ton, but enough for me to not want a tree of life henna'd on it or to feel confident having close-ups taken. The sad thing is that I love being pregnant, and I really do want to have some maternity photos taken, but the idea makes me nervous. All I see being photographed are spotless, markless, hairless bellies, and photographers commenting that they didn't even have to photoshop them. 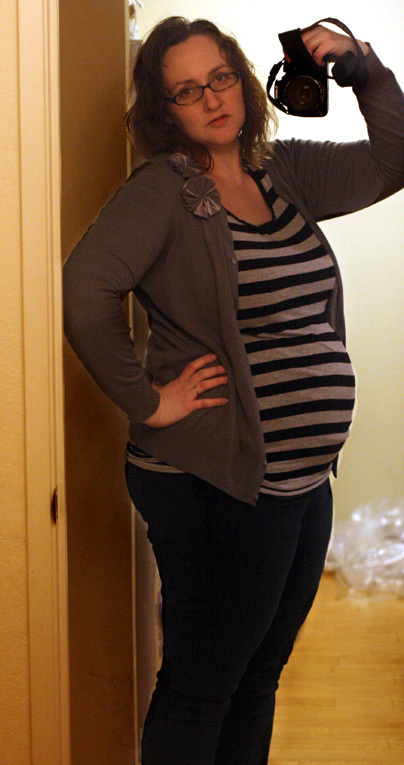 I think there is a bare belly photo on my blog from my pregnancy with Ivey, but it's dark and kind of blurry. Maybe I will get a better one to put up now though, because you're right. My belly is normal, and hey, it's doing an awesome thing. Thank you. I refused to post any pregnant belly shots on FB--despite repeated requests by friends. I felt watched and judged as my belly grew and grew...and I didn't want to feed the beast as it were. But, now I wish I had...now that the body I had then is a then and I can think of the beautiful boy who emerged.